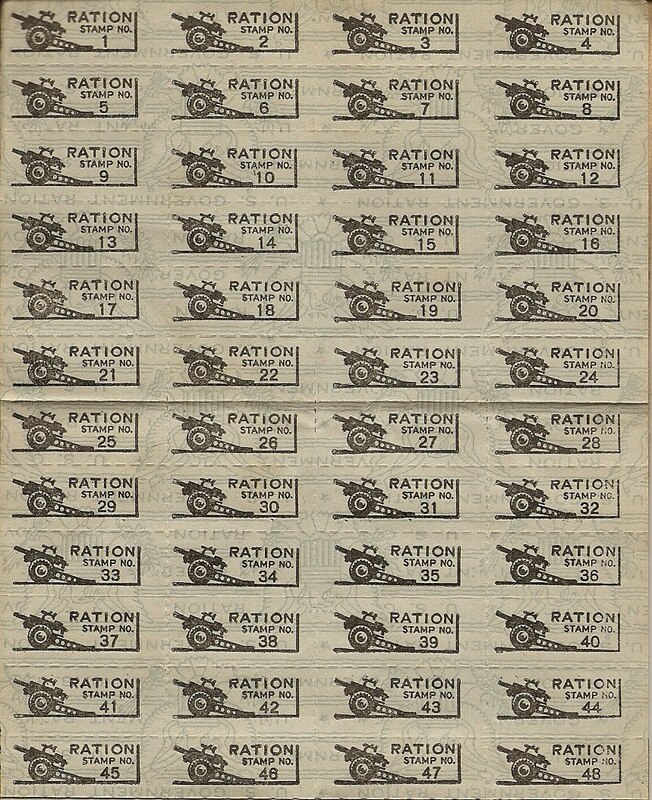 This is the cover to a War Rations Booklet from the Second World War. It belonged to my wife's Grandmother, Prudence V. Pensinger. When the war broke out the country was reeling from the effects of the Great Depression. Manufactured goods were down, and the military was woefully unprepared. We had a lot of catching up to do. 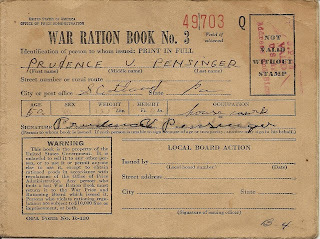 By the spring of 1942 the U.S. Government realized that some sort of rationing would need to be enacted in order to meet the material demands of the war. And so, the Food Rationing Program was developed, much along the lines of the system in place in England. This system would ensure that all Americans would receive a fair share of the available goods, as well as keep some control over the "black market." These are the actual coupons inside of the booklet. Each page was a little bit different. Some showed tanks, while others showed ships, planes or field artillery pieces. It was hoped, that with the people actively engaged in scrap drives, and planting Victory Gardens, more food and materials could be devoted to the war effort. In addition to these measures, by May of 1943, people would need to have a "Sugar Buying Card" in order to purchase an alloted amount of this valuable commodity, which we take for granted today. The registration for these cards took place in school, where each student filled out a form with the names and ages of every member in the household. This information was used to determine how much sugar each family would receive. This was not a guarantee that there would be sugar available, just a way of ensuring that you got a fair share when it was. Sugar rationing ended in the United States shortly after the war, but England and most other countries in Europe would not have unlimited access to "sweets" for almost 15 years or more. 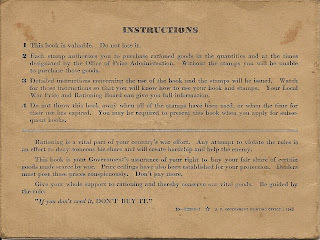 The rear cover contained the rules for using the coupons, along with a warning about paying more for things bought on the black market. 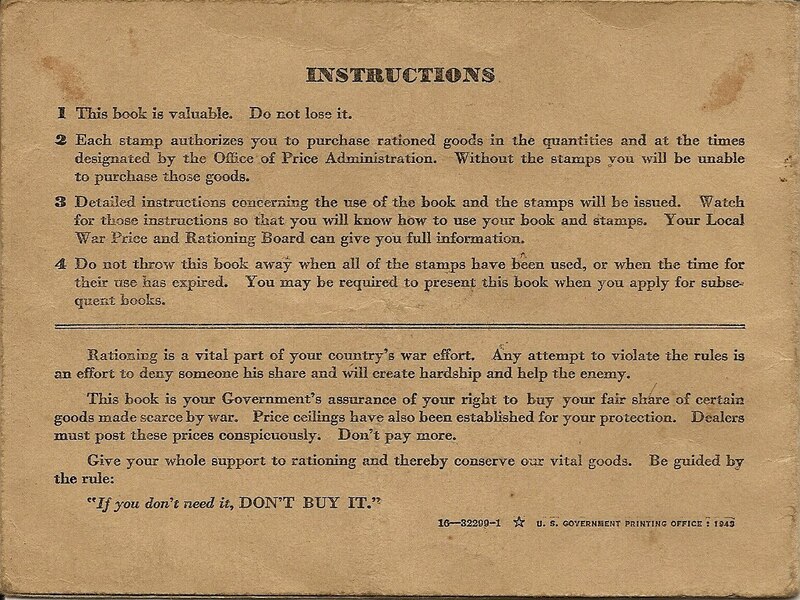 An interesting note on the black market is that there was big difference in the way these Ration Coupons were handled in different areas of the country. 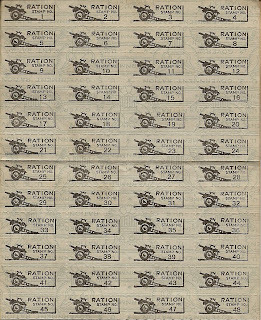 Growing up in New York City during the 1950's and 1960's, I never saw one of these Ration Books. My mother told me stories about them, and the introduction of margarine in lieu of butter. (The margarine came in white blocks, with packets of yellow food coloring to mix into it.) 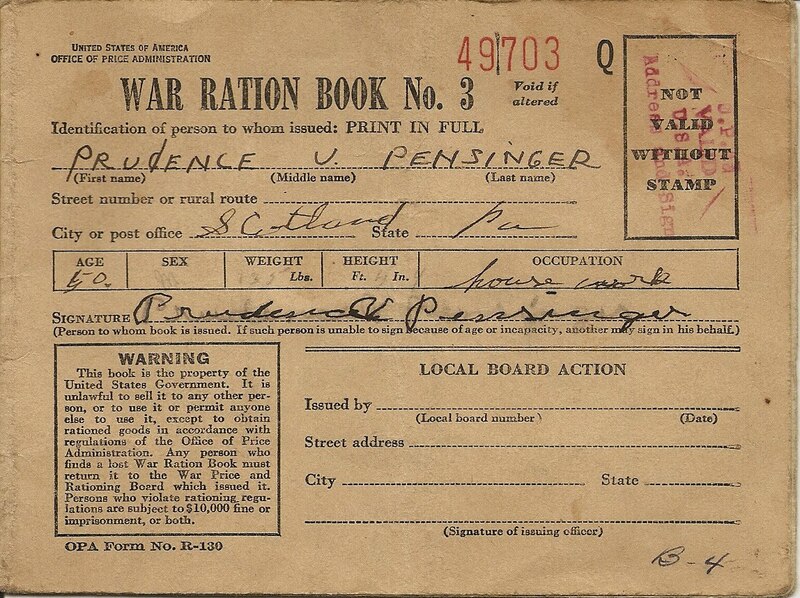 The only explanation I have come up with concerning the lack of these Ration Books in the cities after the war concerns the Black Market. In the cities, with their relative anonymity, it was easier and less risky to buy, sell, or trade the books. With so many people, and so many different neighborhoods to choose from, this was not to hard to do. But in the countryside, the needs, as well as the social structure, were completely different. I was surprised at how many of these coupons were unused, with whole books never having been opened. The explanation is fairly simple. The people in the small towns and agricultural communities engaged in a tremendous amount of bartering. Their "Victory Gardens" were larger than those in the cities, dairy products originated on the farms in these areas, and even kerosene could be made, along with liquor. The people in the cities had no such opportunities, there simply wasn't enough room. It was far easier to find merchants who were willing to "bend" the rules a bit in order to accomodate the customer. The rationing also included cars and clothing. New cars and certain materials for clothing would not become available until the end of 1946.